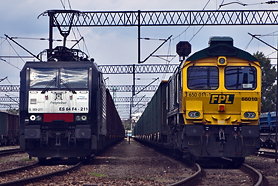 Freightliner PL has been introducing innovations to rail transport technology in Poland since its inception. 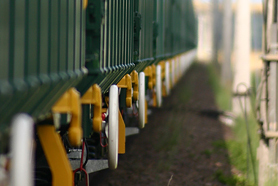 We were the first in Poland to use JT42CWR diesel locomotives, with high hauling capacity, on a large scale. We were also the first to use enhanced axle loads on available railway lines. We pioneered launching bulk haulage trains running at 100 km/h, and launched transboundary trains on a mass scale without changing the traction vehicle at the border station. The gross weight record of a regularly running freight train, conducted with a single traction – 4880 tons, belongs to us. 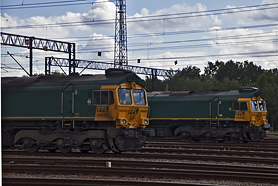 Our standard bulk haulage trains transports 2655 tons of freight and this is unprecedented within the competition. The above would not have been possible without the unique rolling stock, which is frequently designed following our guidelines. 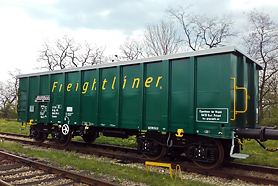 Freightliner PL’s mainline traction vehicles have to meet three requirements: high operational availability, maximum hauling capacity and the ability to perform manoeuvres at the ends of the railway connection. A six-axis diesel locomotive, manufactured by the American company Electro-Motive Diesel, with a capacity of 2420 kW, 94% of which goes to traction. The effective hauling capacity of up to 467 KN is possible thanks to the excellent cooperation of the generating set with the anti-slip system. The use of the original three-axle HTCR type bogies with the system of adjusting the extreme axes of the bogie parallel to the radius of the curves, allows it to overcome curves with radius attainable only for locomotives with two-axle bogies. Part of the JT42C locomotive fleet is approved for driving in Poland and Germany, which allows for run high-speed trans-boundary trains, without losing time at border stations. Six-axle electric locomotive with a diesel last mile module, manufactured by Newag SA. The continuous power of 5000 kW allows to obtain a hauling capacity of 410 KN. 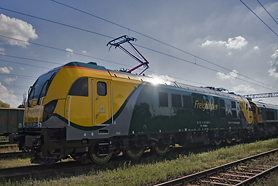 The 580 KW diesel unit allows the driver to perform manoeuvring work on non-electrified railway sidings, as well as traction trains with light trainsets on non-electrified lines. 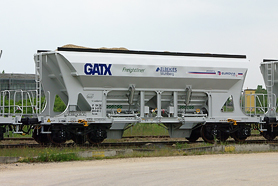 We would not be a significant carrier of construction aggregates if we did not have effective wagons for transporting bulk goods. Our standard trains have a gross tonnage of 3600 tons, and with a favourable route profile and allowable pressures, it can be even more than 4,000 tons. For the customer, this means a one-off load between 2650 and 3000 tonnes and depending on the technical and operational conditions on the route, it may be even more. Regular design coal chopper with a load capacity of 22.5 t / axle. 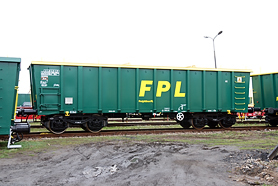 A small change in the width and height of the body and the use of oblique front walls with a shortened length of the total wagon to 12.76 m allowed to obtain a loading volume of 71.8 m³, which is equal to a standard coal-fired car. Wagon payload capacity for class C lines is 59.1 t. In version E06A, the wagon has lugs for fixing a tarpaulin cover in the upper part of the body and is approved for 120 km/h with a load of up to 20 t per axle. 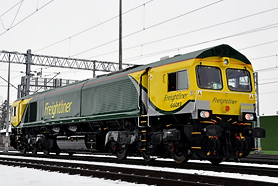 The latest version of type E04, characterised by the use of a new type of bogies and a lighter structure, allowing loading 61.3 t of freight for class C lines. Short regular design coal hopper adapted for transporting heavy bulk materials. Total length 11.3 m, body volume 57.2 m³, load capacity for class C lines – 62 t. Shortened body enables transport of 2700 net ton pendulums from places to which access is limited by the maximum length of the train 520 meters (including length of locomotives). 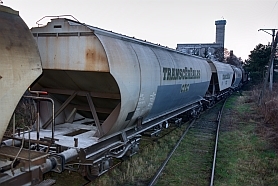 Tank wagons for grain haulage. Load volume from 94 to 110 m³. In the standard 600 meter long train, the trainset volumes support the haulage of almost 2,200 t of wheat. Special design coal hopper wagon, hopper-dozer type, self-tipping hopper, for transporting bulk materials. 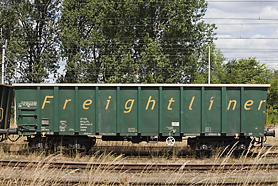 Length with buffers 12.68 m, body volume 49 m3, tare weight 22 t, permissible load capacity up to a load of 22.5 t/d. The wagon has an option of dosed unloading.